" It is the mark of an educated mind to be able to entertain a thought without accepting it." There are two buses which service our school. 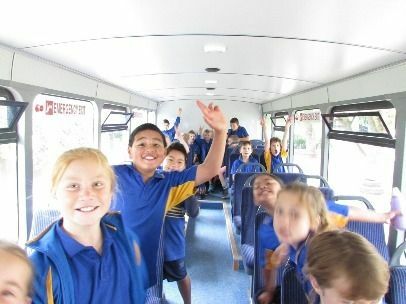 The Blue Bus runs west to Georgetown and the Yellow Bus which runs east to Pukeuri and surrounding areas. Children must follow the bus rules. To find out times and routes please contact the Principal. Assembly is held most Fridays in the school Hub at 2.30pm. All whanau and friends are welcome to join us. This is a chance for each class to share their work or perform an item. Certificates are awarded from each class teacher for achievement , effort, improvement or exceptional acts of responsibility. Throughout the year we often ask for help with various school activities, and we very much appreciate the help we receive. Some of these activities include helping in the classroom, assisting with EOTC (Education Outside the Classroom), sports, coaching, swimming instruction and many other areas. There are many opportunities for parents/carers to be involved in our school. If you would like to help please talk to your child's teacher or Mr Shirley. We are committed to a team approach to education and endeavor to keep parents well-informed as to their child's achievement. A summary of progress is sent home in week 12, 24 and 36 of the year. This also states what the next steps are for your child and gives an indication of your child's attitude and work habits. This record forms the basis of the school's official reporting programme. At the end of the year a summarised account of your child's progress and achievements will be completed. If you require more than one copy please let the secretary know. Parent/Teacher interviews are early in term two each year, but teachers are available at any stage of the year to discuss your child's progress. For such meetings it is helpful to arrange a time out of school hours when the teacher can have the necessary information available, and give you his/her undivided attention.